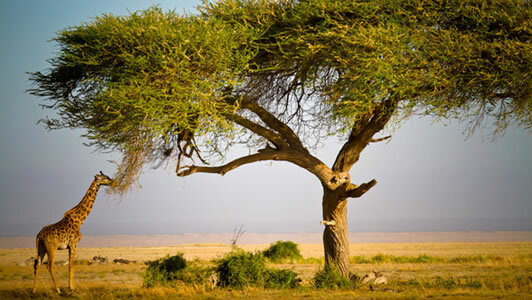 Best 10 Destinations in Africa | . Speaking of cultural, Stone Town in old Zanzibar City was previously an active slave trade site that is well worth a visit for its historic merit. If all you’re longing for is to sit back and relax on a beach, the pristine white sands of Zanzibar have got you covered. There are some ace diving opportunities here, plus the chance to swim with turtles if you prefer an active beach holiday. But if we’re talking about getting active, it’s hard to go past Kilimanjaro, where you can challenge yourself trekking the highest mountain in Africa. Kenya is Africa; Africa is Kenya – it’s entirely what you expect from this impressive continent. Synonymous with Kenya is the great Maasai Mara (particularly impressive during the wildebeest migration), and the Maasai Mara tribe. The Maasai Mara is not the only game reserve worth visiting. Take a bike ride through Hell’s Gate National Park, the inspiration for Pride Rock from The Lion King. The capital city Nairobi offers even greater intimacy, with the opportunity to visit an elephant orphanage or kiss a giraffe during a visit to The Giraffe Center. 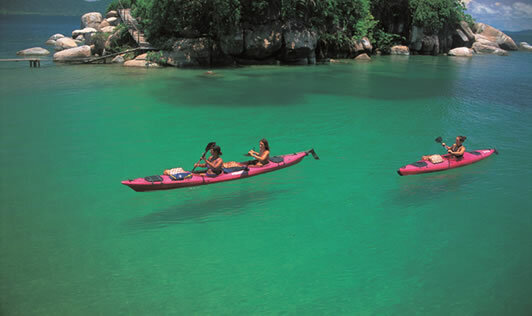 Malawi is largely dominated by the huge Lake Malawi, but it’s the friendly Malawians here who will make your experience memorable. Malawi is stereotypical Africa, in the best sense. Local communities embrace travellers, children run up and braid your hair as you swim in the lake, and a visit to a local school will leave you filling up SD cards with 100s of snaps of children bearing bright, welcoming smiles. There’s an array of landscapes here too, including the dramatic Rift Valley where some amazing hikes are available if you can tear yourself away from the welcoming communities dotting the lake. Like all good African destinations, Zambia has its own game parks including the huge Kafue National Park. The real draw-card here though is the thundering Victoria Falls. The main tourism hub and former colonial city of Livingstone is situated on the falls and offers a range of activities out of the splash zone. 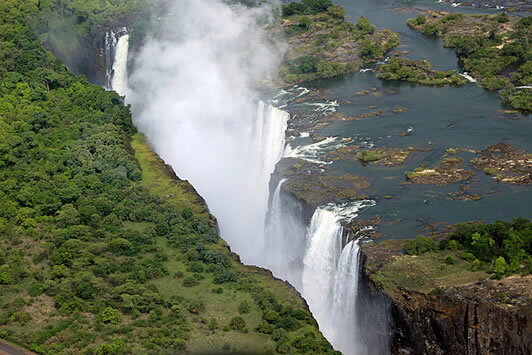 For the adventurous, you can white water raft your way down the Zambezi, bungee jump with a view, or even take a dip in The Devils Pool and swim on the edge of the fall itself. Zambia presents yet another great opportunity to interact with the majestic King of the Jungle, with a lion walk as part of a conservation program just out of Livingstone town. With wildlife parks covering one fifth of the country, Botswana is ideal if you’re after that most coveted African animal encounter. The Okavango Delta is one of the world’s largest inland deltas – jump on a scenic small plane safari and you’ll soon appreciate its size while spotting wildlife from above. 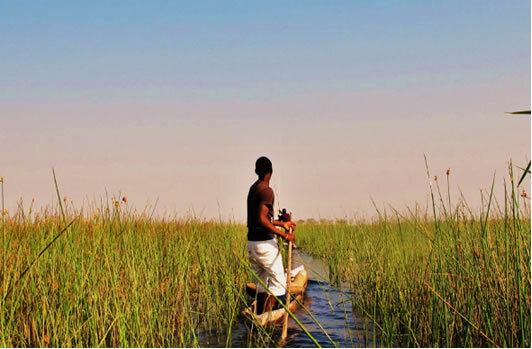 There are opportunities to camp right in the heart of the delta if you’d like, and a ride in a Mocoro boat is definitely a must for an up-close encounter with hippos. 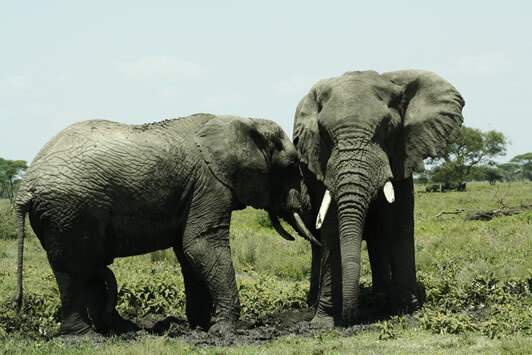 For more animalia, Chobe National Park is famous for its huge population of elephants, along with the rest of the animals that make up The Big Five. With huge airport hubs in Cape Town and Johannesburg, South Africa is the perfect introduction to this varied continent. 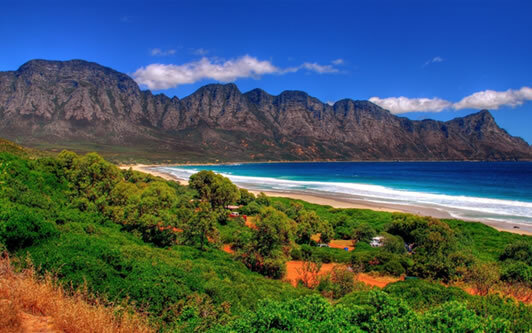 Cape Town itself offers an endless variety of activities, from hiking the beautiful Table Mountain to cage diving with terrifying Great White Sharks. Kruger National Park is famous for lion spotting, providing a huge ‘tick’ off most African bucket lists. But the extraordinary animal encounters in South Africa don’t end there! If, like many of us, you’ve dreamed of riding an Ostrich, Oudtshoorn is worth passing through. For the more daring, South Africa also holds claim to the third highest bungee jump in the world. If you prefer the scenic to screaming, a trip along the Garden Route might be more your style, or perhaps honing in your history knowledge with a visit to the Apartheid Museum, or a Soweto tour in Johannesburg. Namibia is a country of contrasts, from the vast, desolate Namib Desert to Fish River Canyon and the Skeleton Coast, there is plenty of natural beauty to behold. The Namib Desert hosts some of the highest dunes in the world including ‘Sossusvlei’ – a photographer’s playground. While the climb up is likely to get your heart racing, the view is bound to take your breath away. If you do like your heart racing, you can try your hand at sand boarding (also known as ‘seeing how much sand it takes to fill your mouth’). Make sure to check out your speed on the speedometer – speeds of up to 80 kilometers are not unusual! If you have the opportunity to Skydive in Swakopmund, you’ll be presented with a picturesque view of the desert meeting the sea to help distract you from your imminent leap of faith. The lush green of Uganda is worth visiting for a number of reasons, but the standout has to be trekking with the mountain gorillas. 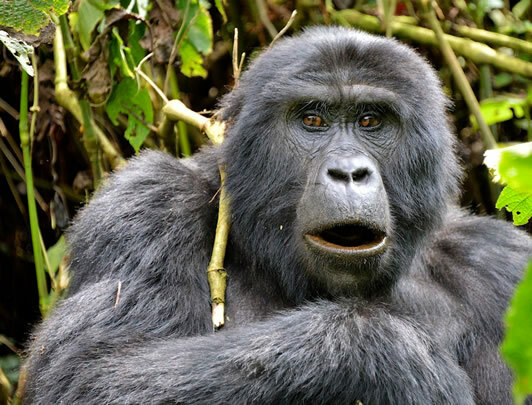 The mountain gorillas are only found in Uganda, the Democratic Republic of the Congo and Rwanda. With numbers predicted at little more than 800, sadly even their days here may be limited. If you’re missing family back home, Uganda also offers the opportunity to get up close and personal our closest relative: the chimpanzee. As with many African destinations, adrenaline junkies can get their fix in Jinja, with white water rafting on the Nile River a popular choice, along with kayaking the grade five rapids. For all the history buffs out there, Egypt is a must. The Egyptians are one of the most well documented ancient societies, largely thanks to the preserved archaeological sites. 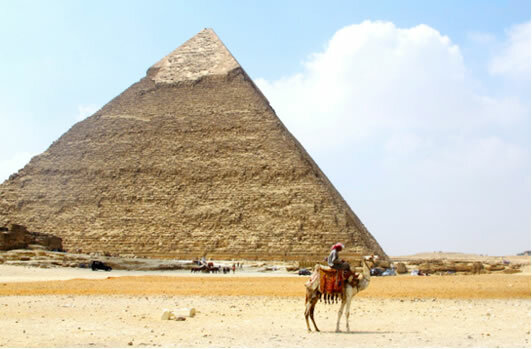 Best of all, the infamous pyramids of Giza and The Sphinx are conveniently located just outside the capital city of Cairo. Stepping inside the Egyptian Museum presents you with endless relics to gaze at. If you thought history was purely an opportunity to snooze in school, you can always escape to Sharm El Sheikh – one of the world’s premier dive sites – or jump on a cruise down The Nile. A visit to Morocco is like stepping back in time. Get lost in the manic markets of Marrakech and barter for carpets, spices and even chameleons, before indulging in a Moroccan feast of cous cous and tagine as snake charmers and Arabic storytellers entertain you in Jemaa el-Fna square. 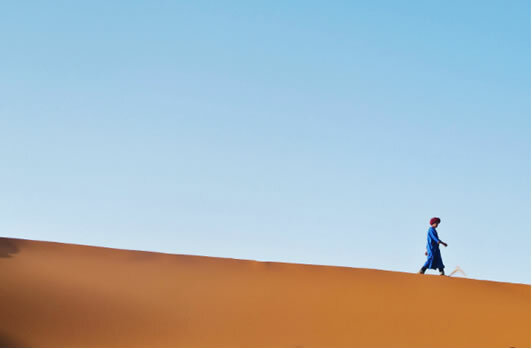 Moving out of the city and into the desert at Erg Chebbi, taking a ride on a camel into the middle of the Sahara to camp under the stars is worth braving the heat for. If you prefer your sand surrounded by sea, the surf in Taghazout is the perfect opportunity to cool off.